Coop & Cami Ask The World is premiering on Friday, October 12th at 8:30 p.m. on the Disney Channel and we couldn’t be more excited as we just loved the first episode. This does not happen that often, but we were able to get a chance to talk to Ruby Rose Turner, Dakota Lotus, Paxton Booth, Albert Tsai, and Olivia Sanabia about the show and their careers so far. Make sure to tune in tonight as you won’s be disappointed. Also make sure to check out our review of the first episode on the site as well. Take a look below and read up on why the cast says we should all be watching their new show Coop & Cami Ask The World and some other fun facts about themselves. BSCKids: What do you find to be the most fun in playing the character of Coop? Dakota Lotus: I really love playing Cooper, especially his sense of humor. He is always getting himself in sticky situations, and I love that he is not afraid of being embarrassed. BSCKids: Are there any funny behind the scenes stories you have from filming the show? Dakota Lotus: The cast and I are always making each other laugh by doing fun pranks AND are constantly trying to scare each other. BSCKids: What is your favorite show? Dakota Lotus: Raven’s Home and America’s Got Talent. BSCKids: Tell us why everyone should tune in to watch Coop & Cami Ask The World? Dakota Lotus: Everyone should tune in to Coop and Cami Ask the World because it’s a super funny show with some really awesome and unique “would you (w)rather” questions! BSCKids: Do you have any similarities with your character Cami? Ruby Rose Turner: We have a ton of similarities – lots of confidence and determination! BSCKids: Tell us something people would be surprised to find out about you. Ruby Rose Turner: I can do funny eye tricks! BSCKids: Besides your own show, what is your favorite Disney Channel show of all time? Ruby Rose Turner: Shake It Up, Wizards of Waverly Place and Good Luck Charlie! Sorry, can’t pick just one! Ruby Rose Turner: It’s a super fun, relatable family show and it will keep you laughing! BSCKids: Since Charlotte seems to want to avoid participating in “Would You Wrather” because she might embarrass herself, has there been a time you have embarrassed yourself while filming in real life? Olivia Sanabia: I would say the most embarrassing thing that I have done during filming is definitely having to put my face into a bowl of mashed potatoes. I accidentally got some in my eye, so I had one eye closed and green potatoes all over me! It was pretty embarrassing! But everyone was so sweet and made me feel much better about it. BSCKids: What is your favorite thing about playing the role of Charlotte? Olivia Sanabia: My favorite part about playing Charlotte is that she is high-spirited and a hard-worker! I love that she is outgoing. I feel so honored to play a character who will hopefully make people laugh. BSCKids: Olivia, we did an interview with you about “Just Add Magic” back in 2016. How do you think you have grown as an actress since then? Olivia Sanabia: I think I have grown as an actress in the sense that I have become more familiar with a new type of acting. Being on “Coop and Cami Ask the World” has allowed me to be free in doing crazy things like becoming a human bowling ball (yeah, that really happened). Olivia Sanabia: Everyone should tune into our show because it is guaranteed to make you smile. The energy of the show is electric, and you will want to be part of this family when you see all the fun they have! BSCKids: Tell us a bit about how your audition went for Ollie Wrather? Do you find him an easy character to play? Paxton Booth: It wasn’t too different from other auditions I’ve been on except that it was in the Disney building. That was crazy! I wasn’t too nervous about the audition until I got there, and the walls were covered in posters of all the show I love to watch on Disney Channel. That is when it hit me! Ollie is kind of the opposite of me, so sometimes I ask myself what I would do in that situation and then just do the opposite. The physical stunts are so much fun and come pretty naturally, but when it comes to the gross gags, that’s when it gets a little tough for me. I’m not big on slime! Thankfully we have an awesome crew that always has towels waiting close by! BSCKids: You were on one of our favorite shows The Toy Box… tell us a bit about that experience and what your favorite toy of all time is. Paxton Booth: “The Toy Box” was fun and I got a chance to meet some really cool kids and toy inventors. They didn’t show it on screen, but we spent a lot of time talking to each inventor and playing with each of the toys. I’ve been collecting Hot Wheels since I was four years old. My collection is a little over 1000 right now, and it includes everything from some of the original classics to the newest ones. BSCKids: What is your favorite thing to do on set of the show, while not filming? Paxton Booth: When we aren’t filming, I’m usually in school or relaxing in my trailer watching movies. When we are shooting and have a little time in between scenes, my favorite thing to do is to shop for shoes with my TV mom Rebecca Metz (she plays Jenna Wrather) on her phone. Paxton Booth: It is a family show that I think everyone can relate to. There’s comedy, teenage and family drama along with some silly stunts. It’s one of those shows where your family should just order a pizza, veg out on the couch together and laugh with us! BSCKids: How did you get the role of Fred and how do you get in character before filming? Albert Tsai: I auditioned for the role of Fred. I was so excited when I got the role, because I have watched Disney Channel since I was very little. And now I am doing a live-action family comedy series on Disney Channel. So fun! I usually prepare for my role by reading the entire script first, then practicing my lines. BSCKids: If you could guest star on another Disney Channel show, which one would it be and why? 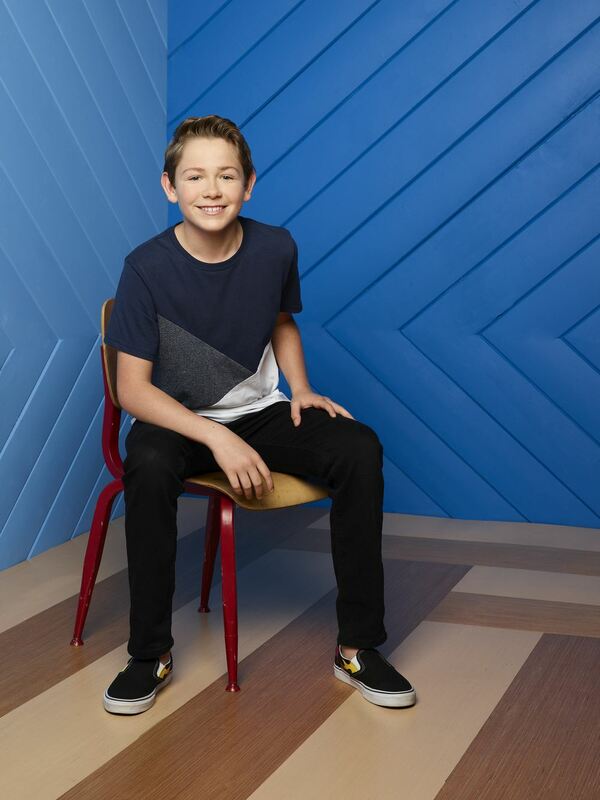 Albert Tsai: I would guest star on Andi Mack, because I’d like to try out the kind of dramedy genre that Andi Mack is as well as play a different type of character. This was absolutely phenomenal that we were able to talk to the main cast for the show and we loved every minute of it. Stay tuned at the site for more Coop & Cami Ask the World stories and thanks to Disney and the cast of the show for making this happen.